Bus advertising is one of the best ways to make your company stand out. If you are looking for an eye-popping advertisement while con your way to a convention, trade show, or otherwise, a bus wrap is the way to go. This is a very popular tactic to advertise and promote your brand of message. If you are looking for top quality bus advertising, we can help you find the best solution. 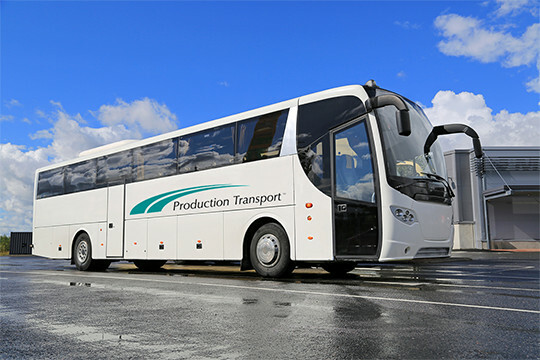 At Production Transport, we are proud to provide excellent shuttle bus service and limo service for VIP transport. Whether you have a large group traveling to a conference, trade show, or another event, having a shuttle bus service or VIP town car service is very beneficial. You won’t have to worry about planning the transportation or that your employees will have a stressful time figuring out where to go. With corporate transportation by means of a mini bus or motor coach, your team or guests can sit back, relax and have an enjoyable time. We understand that traveling in an unfamiliar city can be overwhelming and stressful at times, which is why we are more than happy to provide such a convenient and reliable solution. Since 1982, we have been continuing to grow and expand the horizon of corporate ground transportation. With our easy, cost-effective shuttle bus services, numerous companies and groups have found a happy solution for transportation. Are you ready to get unforgettable bus advertising?